Two white duplex houses with a red tiled roof. There is a water boiler on top of the roof. The penthouse window of semi-oval shape and there is an air conditioner aside the window. The penthouse is over the first-floor balcony under the sloppy red tile overhang. The land lot of the houses is behind the one-meter-tall fence and some decorative plants and trees grow in the land plot. The private parking is beyond the house yard in front of it. 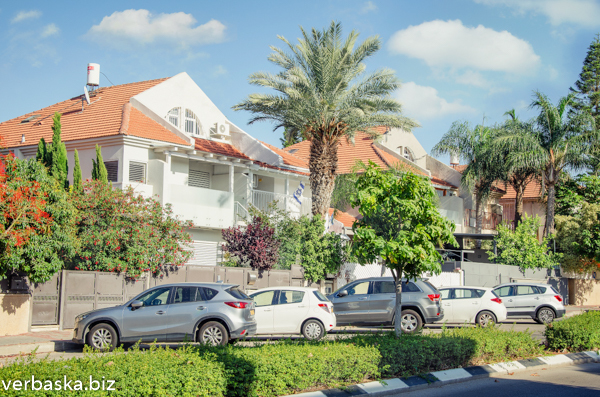 The quiet living quarters are located on Shakhar Street, Rishon LeZion, Israel. If you want to buy this image please click on it for details.